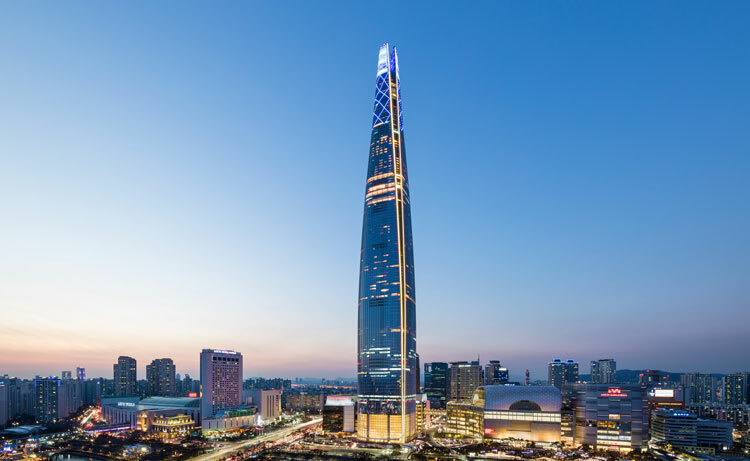 Emporis recently announced its annual Emporis Skyscraper Award to the Lotte World Tower in Seoul, South Korea. Every year since 2000, Emporis’ expert international jury has chosen the top 10 skyscrapers completed during the previous calendar year. The jury is formed of architecture experts from all over the world who judge nominated buildings according to aesthetic and functional design criteria. Lotte World Tower is currently South Korea’s tallest completed building and, in many ways, a skyscraper of superlatives, Emporis said. The 555-meter-high tower houses the world’s highest glass-bottomed observation deck. Even the elevator is record-breaking; at 600 meters per minute, it is currently the fastest in the world. The winner especially impressed the jury with its harmonious design that gives the skyscraper a soft and natural dynamic. “The design combines modern elements with classical forms from Korea’s art and cultural history, making Lotte World Tower a particularly harmonious skyscraper,” the jury said. This year’s second place went to the Generali Tower in Milan, designed by recently deceased architect Zaha Hadid. The skyscraper’s extravagant form earned it the nickname “Lo Storto,” which means the Twisted One. The jury especially praised the building’s high standards in terms of energy efficiency. The building has a double-skin façade and a sophisticated sunscreen, which ensures excellent energy performance on each floor. Generali Tower has therefore also received LEED Platinum certification, the U.S. Green Building Council’s highest level. The third-place project is 150 North Riverside in Chicago. Designed by Goettsch Partners, it is the building’s innovative and complex engineering work that stands out. The skyscraper is located next to the Chicago River on one side and several active train tracks on the other. The extremely narrow lot that the tower sits on had been deemed impossible to build on for years due to its limited size. Goettsch Partners then came up with the tower’s daring design that features only a very small footprint while the building grows outward to its full size on the higher floors — a masterpiece of structural engineering. This year marks the first time the award has been given to a South Korean building. Surprisingly there is not a single Canadian skyscraper among the winners this time. Nevertheless, there is still cause for celebration for North America; three projects from the U.S. made it into the top ten. Also, for the first time in the history of the Emporis Skyscraper Award, a project from Africa is among the winners. The Britam Tower, currently one of the tallest buildings in East and Central Africa, made tenth place. Information provided by Emporis (www.emporis.com), which provides a database of information about building and construction projects.